Skip Morris came up with his Anatomical Nymph series about 20 years ago in the late 1980's. They attempt to accurately represent mayflies with the use of gill materials, three tails, wingcase, soft legs, and a stout dark body. Skip created variations for Baetis/PMD and Green Drake. 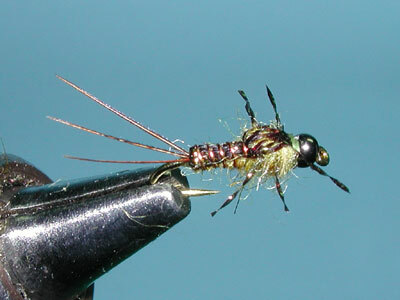 He also used the same pattern variations to create two stonefly patterns, the Anatomical Golden Stone and Anatomical Salmonfly. 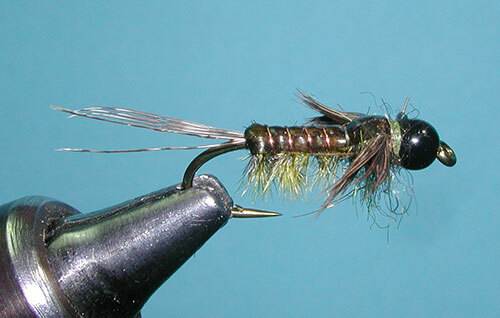 Many stonefly patterns use similar steps but what makes Skip's pattern unique is the use of henback for the legs.These are sections of a henback feather in which the stem is cut into short segments. Choose the segment which gives you the proper leg length when it is secured on top of the hook shank. Some fibers need to be removed from the stem to give a bare piece of stem to secure to the shank. After securing a section of legs, dubbing and a section of wingcase is added. 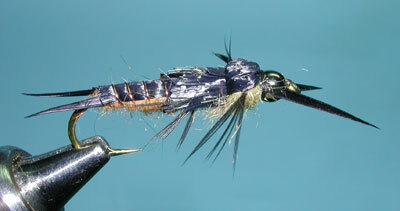 Each stonefly usually has three leg sections and two trimmed wing cases. A third wingcase is pulled over the thorax. Ken Morrish designed a similar pattern that he calls Anato-Mays. 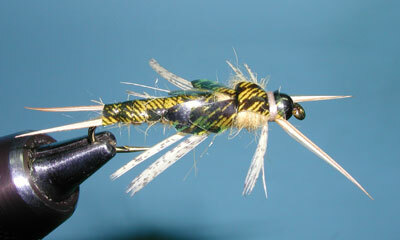 He markets these patterns through Idylwilde Flies. They come in different colorations: Hare's Ear, Olive, Tan, and Peacock. The Hare's Ear variation is a great pattern for Callibaetis. The tying sequences for the Anato-Mays are basically the same as Morris'. 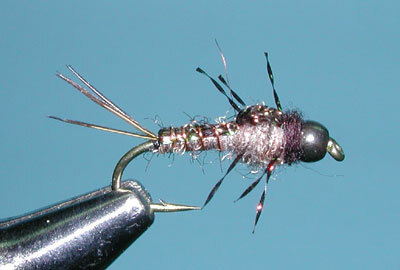 The tails are a standard technique with many mayfly nymphs. Create a small mound of thread at the tail tie down position and splay the tailing fibers with thread tension as you secure those fibers against the thread mound. Using your thumbnail behind the fibers will help set them in the proper position. Important... do not secure any material past the thread mound or you'll ruin the effect. The dubbing around the leg segments tends to be the tricky part of the pattern. 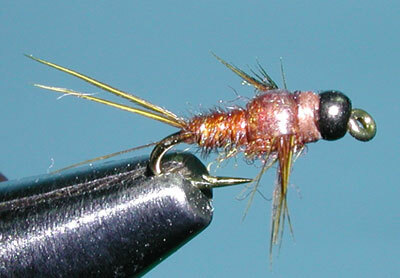 I tie in the first set of legs to the top of the shank in front of the abdomen. Then, using the same material as the flashback, I bring back the material and secure it also at the front of the abdomen. This is now my wingcase. Dubbing is applied over the rear half of the thorax region. 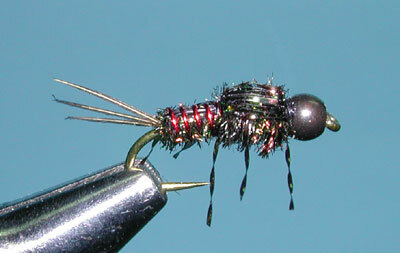 Next, I set the next two pairs of legs and dub between them and in front of the thorax just behind the bead. Finally, I bring the wingcase material over the thorax and secured with thread wraps and a whip finish. Trim the legs to the size you prefer.